The Philips desktop transcription system is a document creation solution specifically designed to make transcription easy and intuitive. 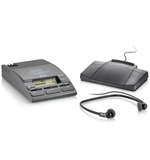 With the ergonomic foot pedal for hands-free playback control and the professional transcription headphones, the desktop transcription system takes transcription to a new level. The secret of the transcription system 730 is its easy and fast access to any part of the tape.